You'll explore the less-touristy side of things at Eastern Beach Reserve and Point Lonsdale Lighthouse. Get some historical perspective at Old Melbourne Gaol and St Paul's Cathedral. When in Melbourne, make a side trip to see Ocean Beach in Nelson, approximately 1h 20 min away. Next up on the itinerary: get engrossed in the history at Shrine of Remembrance, admire the natural beauty at Royal Botanic Gardens, contemplate in the serene atmosphere at St. Patrick's Cathedral, and tour the pleasant surroundings at Melbourne Zoo. For traveler tips, where to stay, ratings, and tourist information, use the Melbourne trip planning website . Bournemouth, UK to Melbourne is an approximately 27-hour combination of train and flight. You can also do a combination of train and flight. Traveling from Bournemouth to Melbourne, you'll lose 10 hours due to the time zone difference. Expect much hotter temperatures when traveling from Bournemouth in February; daily highs in Melbourne reach 32°C and lows reach 16°C. Finish your sightseeing early on the 7th (Thu) so you can travel to Sydney. We've included these beaches for you: Bondi Beach and Manly Beach. 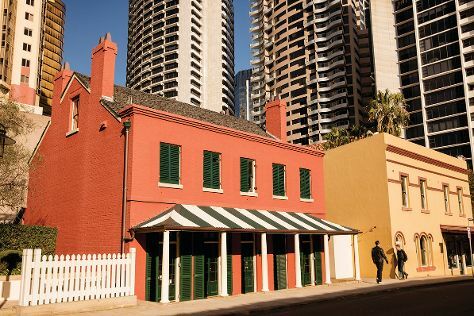 Deepen your sense of the past at sights like The Rocks and Justice & Police Museum. Step out of Sydney to go to Wollongong and see Nan Tien Temple, which is approximately 1h 30 min away. The adventure continues: see a show at Sydney Opera House, hike along Bondi to Coogee Beach Coastal Walk, take in the views from Sydney Harbour Bridge, and take in nature's colorful creations at The Royal Botanic Garden. To see where to stay, maps, photos, and more tourist information, read our Sydney trip itinerary builder site . Getting from Melbourne to Sydney by flight takes about 3.5 hours. Other options: do a combination of shuttle and flight; or drive. Traveling from Melbourne in February, expect a bit warmer with lows of 23°C in Sydney. 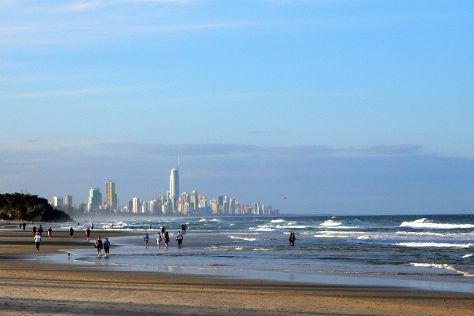 Finish up your sightseeing early on the 10th (Sun) so you can travel to Gold Coast. Relax by the water at Burleigh Heads Beach and Kirra Beach. Visit New Govardhana Australia and Fingal Head Lighthouse for their historical value. The adventure continues: kick back and relax at Coolangatta Beach, make a trip to Rotary Carousel Broadbeach, have some family-friendly fun at Xscape Reality, and explore the striking landscape of Burleigh Head National Park. For ratings, where to stay, reviews, and other tourist information, refer to the Gold Coast trip itinerary planning tool . You can fly from Sydney to Gold Coast in 3.5 hours. Other options are to do a combination of flight and train; or drive. 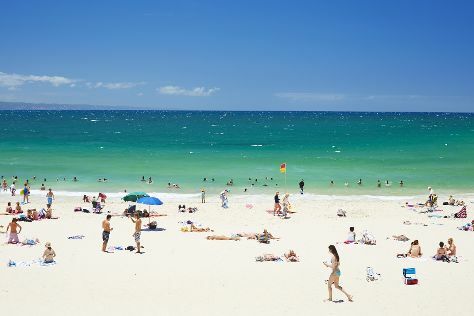 In February, daily temperatures in Gold Coast can reach 32°C, while at night they dip to 24°C. Finish your sightseeing early on the 13th (Wed) to allow enough time to drive to Noosa. Kick off your visit on the 14th (Thu): stroll through Mooloolaba Beach, explore the historical opulence of Sunshine Castle, and then tour the pleasant surroundings at Noosa Main Beach. Keep things going the next day: explore the wealth of natural beauty at Noosa National Park and then take some stellar pictures from Laguna Lookout. Planning Noosa trip won't be overwheling when you use's Insprock itinerary maker. Traveling by car from Gold Coast to Noosa takes 3 hours. Alternatively, you can take a bus; or take a train. Finish your sightseeing early on the 15th (Fri) so you can drive to Brisbane. Kick off your visit on the 16th (Sat): take in nature's colorful creations at Brisbane Botanic Gardens Mt. Coot-tha, then admire the masterpieces at GOMA, and then admire the natural beauty at Roma Street Parkland. Get ready for a full day of sightseeing on the 17th (Sun): steep yourself in history at Wolston Farmhouse, then look for all kinds of wild species at Lone Pine Koala Sanctuary, and then admire all the interesting features of Suncorp Stadium. To find ratings, photos, maps, and more tourist information, use the Brisbane driving holiday app . Drive from Noosa to Brisbane in 2 hours. Alternatively, you can take a train; or take a bus. In February, daytime highs in Brisbane are 33°C, while nighttime lows are 24°C. Wrap up your sightseeing on the 17th (Sun) early enough to travel to Townsville. Start off your visit on the 18th (Mon): take in the exciting artwork at The Drill Hall Studio, then kick back and relax at The Strand, then go for a walk through Castle Hill, and finally steep yourself in history at National Trust Heritage Centre. To see maps, reviews, other places to visit, and other tourist information, go to the Townsville trip itinerary maker site . You can fly from Brisbane to Townsville in 4.5 hours. Other options are to take a train; or drive. Prepare for somewhat warmer weather when traveling from Brisbane in February: high temperatures in Townsville hover around 37°C and lows are around 28°C. Cap off your sightseeing on the 18th (Mon) early enough to travel to Port Douglas. Start off your visit on the 19th (Tue): kick back and relax at Palm Cove Beach, then identify plant and animal life at Mossman Gorge, and then stop by With Sugar. Here are some ideas for day two: get a new perspective on things with Boat Tours & Water Sports. Traveling by combination of flight and shuttle from Townsville to Port Douglas takes 4.5 hours. Alternatively, you can drive; or do a combination of bus and shuttle. February in Port Douglas sees daily highs of 36°C and lows of 28°C at night. Wrap up your sightseeing on the 20th (Wed) to allow time to drive to Cairns. On the 21st (Thu), discover the deep blue sea with a scuba or snorkeling tour. 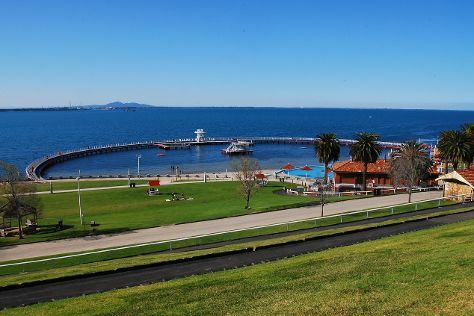 On your second day here, look for gifts at Our Animals Our Earth, then identify plant and animal life at Australian Butterfly Sanctuary, then kick back and relax at Trinity Beach, and finally admire the natural beauty at Botanical Gardens. To find more things to do and more tourist information, read Cairns day trip planning tool . You can drive from Port Douglas to Cairns in 1.5 hours. Other options are to take a bus; or take a shuttle. In February, plan for daily highs up to 36°C, and evening lows to 28°C. Finish your sightseeing early on the 22nd (Fri) to allow enough time to travel back home.